Incompetence is their best Defense - The NYT charged Sarah Palin/Tea Party with being responsible for Gabby Giffords shooting in 2011, because she once ran a campaign flyer that had crosshairs of various weak districts (including hers), and a conservative loon had obviously followed their suggestion. The Democrats had of course done the same exact thing to Republican districts (or used targets), but the Times doesn't let moral consistency get in the way of slander piece. Everything was wrong in their assumptions: the shooter was an atheist, loved John Kerry and the communist manifesto, hated Bush, and wasn't aware of the flyer. They were forced to publish retractions/corrections on all that in their News Pages, but continued to write/allow articles blaming Palin in their Editorials, long after those corrections were issued in their own paper. Palin sued, and their defense was that they were negligent but not malicious, and the Judge sided with them. The NYT can't help it if their editors and fact checkers don't read their own Newspaper or retractions, nor be expected to know the basic facts before writing on them. Seriously. 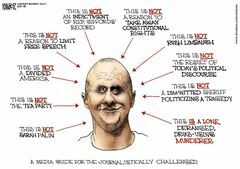 The shooter (Jared Lee Loughner) was not a conservative (as the paper had misreported), he was actually a left leaning loon (his favorite book was the Communist Manifesto, he hated Bush, loved John Kerry, was an atheist and so on). He had met Gifford before, and he had never seen or was aware of the crosshair flyer, and his reasons were his delusions and conspiracies and he was reasoned to be mentally incompetent. The Times had reluctantly published all that, eventually in their News sections, but continued to publish articles in their Editorial pages that trashed Palin (and made linkages between Palin and Loughner, that their News pages had admitted weren't there). Palin sued for defamation. And the Times defense, was that their editorial folks shouldn't be expected to fact check, or even read their own paper. So their defense what they were negligent, but not malicious by repeating mistruths months after they had been corrected in their own paper. "We think the evidence against the Times supports at most a finding of negligence in failing to discover the misstatements, and is constitutionally insufficient to show the recklessness that is required for a finding of actual malice." ~ New York Times Lawyers arguing that they were negligent. Eventually, the Judge sided with the NYT and ruled that NY Times can win a case by proving the author of the NY Times Editorial doesn't read the NY Times (nor did any of the fact checkers or editorial staff that the piece went through), so can't be expected to know they were slandering Palin. So their incompetence has become so accepted, that they can dodge responsibilities for truthfulness, that you and I as non journalists, would never get away with. This page was last edited on 20 March 2019, at 02:38.